Inspire Bingle: What is power to you? 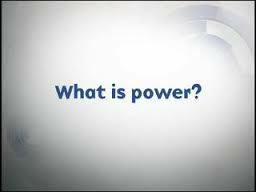 Three executives were defining what power means, and how to know when you have really arrived. One said: "I'll tell you what real power is. It's being invited to the President's House for a personal conversation with the President." Another said: "No, that's not it. You know you have arrived when you've been invited to the President's House for a personal conversation with the President, the hot line rings, and he just looks at it and decides not to answer it." The third executive said: "You both have it all wrong. Real power is when you’re invited to the President's House for a personal conversation with the President, the hot line rings, the President answers it and says, 'Here, it's for you.'" I guess we’re all looking for ultimate power, aren’t we? And I guess we all define it differently. It’s especially easy at this time of year to define power by the one who has the most toys. Define power differently this holiday season. Define power by the one who has the most love. You define power as love as you listen to your life and make a life, not just a living. That’s how to find real power in God’s love. I am|I'm} very enjoyed with this blog. Its an educational topic. It help me greatly to solve some problems. Its opportunity are so fantastic and working style so speedy.